Last year our house was on the market and whenever we got a showing, I tried to leave some warm cookies. It made the house smell good, sure, but I remember looking for houses and it was EXHAUSTING. I might’ve bought any house that offered me warm cookies, even if the house had been totally wrong for us. Anyhoo, last year, about this time, I left two dozen of these on a tray with a big pitcher of lemon water. We were leaving just as the family pulled in — the parents and their two kids gave us a friendly wave. 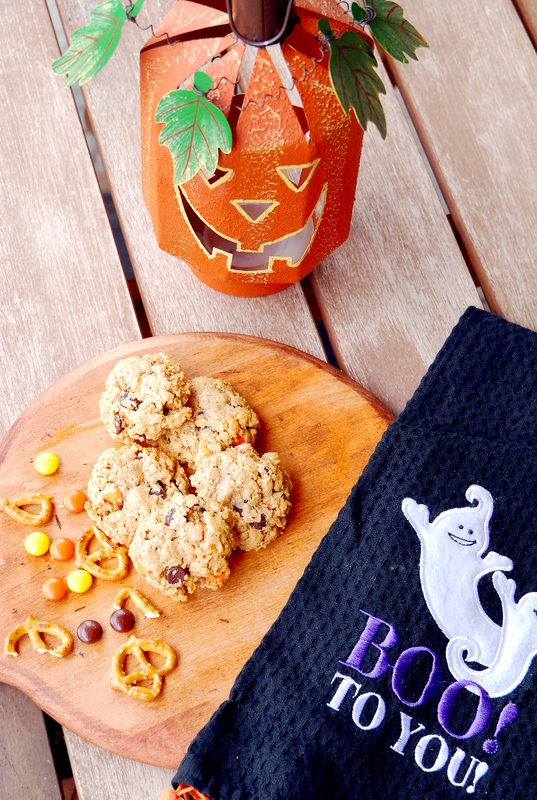 You guys, when we got back an hour later EVERY SINGLE COOKIE WAS GONE! That’s 24 cookies. Grated, they were small cookies, but STILL!!! Did they eat them all? Stuff them in their bag for later? Give them to passers-by on the street? Oh my goodness! We never did find out what happened, but they must’ve been good, right? Preheat oven to 350 degrees F (175 degrees C). Line a cookie sheet with silpat or parchment. 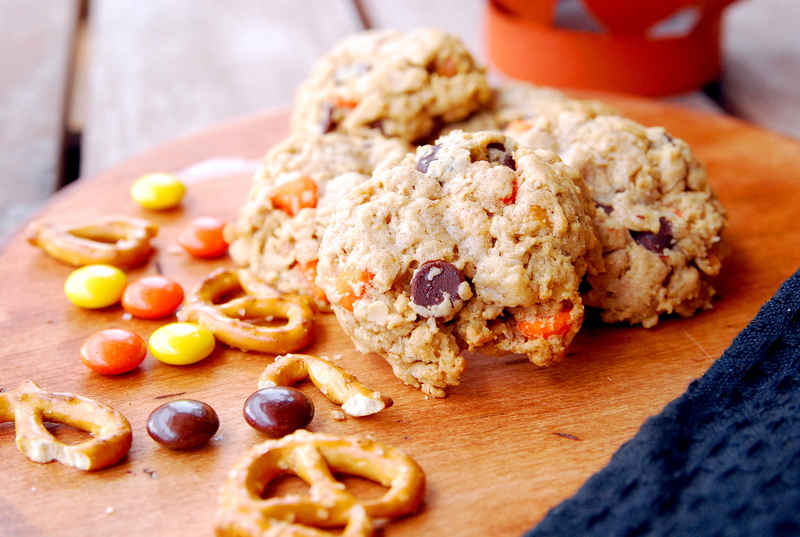 Mix together oatmeal, baking soda, chocolate chips, Reese's Pieces, and pretzels. Set aside. In the bowl of a stand mixer, combine white sugar, brown sugar, butter, vanilla, eggs and peanut butter. Gradually add the oatmeal mixture to the wet ingredients. Mix until combined. Roll dough into 1-inch balls.